Too much sugar will make you fat, but too much artificial sweetener will ... do what exactly? Kill you? Make you thinner? Or have absolutely no effect at all? This week marks the 40th anniversary of the Food and Drug Administration's decision to ban cyclamate, the first artificial sweetener prohibited in the U.S., and yet scientists still haven't reached a consensus about how safe (or harmful) artificial sweeteners may be. Shouldn't we have figured this out by now? The first artificial sweetener, saccharin, was discovered in 1879 when Constantin Fahlberg, a Johns Hopkins University scientist working on coal-tar derivatives, noticed a substance on his hands and arms that tasted sweet. No one knows why Fahlberg decided to lick an unknown substance off his body, but it's a good thing he did. Despite an early attempt to ban the substance in 1911  skeptical scientists said it was an "adulterant" that changed the makeup of food  saccharin grew in popularity, and was used to sweeten foods during sugar rationings in World Wars I and II. Though it is about 300 times sweeter than sugar and has zero calories, saccharin leaves an unpleasant metallic aftertaste. So when cyclamate came on the market in 1951, food and beverage companies jumped at the chance to sweeten their products with something that tasted more natural. By 1968, Americans were consuming more than 17 million pounds of the calorie-free substance a year in snack foods, canned fruit and soft drinks like Tab and Diet Pepsi. But in the late 1960s, studies began linking cyclamate to cancer. One noted that chicken embryos injected with the chemical developed extreme deformities, leading scientists to wonder if unborn humans could be similarly damaged by their cola-drinking mothers. 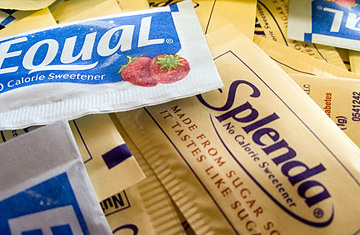 Another study linked the sweetener to malignant bladder tumors in rats. Because a 1958 congressional amendment required the FDA to ban any food additive shown to cause cancer in humans or animals, on Oct. 18, 1969, the government ordered cyclamate removed from all food products. Saccharin became mired in controversy in 1977, when a study indicated that the substance might contribute to cancer in rats. An FDA move to ban the chemical failed, though products containing saccharin were required to carry warning labels. In 2000, the chemical was officially removed from the Federal Government's list of suspected carcinogens. In 1981, the synthetic compound aspartame was approved for use, and it capitalized on saccharin's bad publicity by becoming the leading additive in diet colas. In 1995 and 1996, misinformation about aspartame that linked the chemical to everything from multiple sclerosis to Gulf War syndrome was widely disseminated on the Internet. While aspartame does adversely effect some people  including those who are unable to metabolize the amino acid phenylalanine  it has been tested more than 200 times, and each test has confirmed that your Diet Coke is safe to drink. Nor have any health risks been detected in more than 100 clinical tests of sucralose, a chemically altered sugar molecule found in food, drinks, chewing gum and Splenda. The fear-mongering and misinformation plaguing the faux-sweetener market seems to be rooted in a common misconception. No evidence indicates that sweeteners cause obesity; people with weight problems simply tend to eat more of it. While recent studies have suggested a possible link between artificial sweeteners and obesity, a direct link between additives and weight gain has yet to be found. The general consensus in the scientific community is that saccharin, aspartame and sucralose are harmless when consumed in moderation. And while cyclamate is still banned in the U.S., many other countries still allow it; it can even be found in the Canadian version of Sweet'n Low. Low-calorie additives won't make you thinner or curb your appetite. But they help unsweetened food taste better without harming you. And that's sweet enough.